1000 trees project needs volunteers! Adam here. Hello from Hong Kong! Sorry for the lack of pictures in this post, but I didn’t get my phone (which is also our only camera) charged until today so we don’t have any pictures from the 16th or 17th. Nick and I arrived in Hong Kong the night of the 16th. The flight was fine, as good as one can expect from Air Asia, and after getting out of the airport we took a taxi over to the site of the convergence, The Kadoorie Centre. When we arrived there, not only were we surprised to find someone waiting there to greet us, but to my great delight, it was my fellow May ’08 PDC classmate, May Cheng! May sorted us out with some dinner and showed us to our accommodation. We were very impressed with our room, which is basically a nice hotel room all to ourselves. We were expected dorm room accommodation, but I think May made sure we got something a bit nicer. The next day, after a nice night’s sleep on real mattresses, Nick and I went out to check out the permaculture festival and the Kadoorie Centre. We were very impressed on both accounts. The Kadoorie Centre did a fantastic job getting the locals to come out to the festival, and actually the festival was mostly attended by local Hong Kongers, most of whom were being introduced to permaculture for the first time. The festival had booths with local farmers selling organic produce, craft-making activities, herb cutting workshops, various local wares, and all sorts of good things. We didn’t want to spend too long at the festival though, as the next day we would be spending a great deal of time there manning a booth representing Panya. So, after checking out the centre and festival a bit, Nick and I headed out to explore the city a bit, since it might be the only chance we will have to see it. Actually, we didn’t explore the heart of the city but ‘Yuen-Long’, a district of Hong Kong more towards the outskirts and which May recommended to us. Our first order of business was to try some awesome local Cantonese food. Having succeeded in that, we went and tried some more awesome local Cantonese food. Then we continued to wander around the city, enjoying the sights and smells of Hong Kong. We tried in vain to find a local Hong Kong beer to try, but instead ended up drinking a Guinness (something which I’ve sorely missed) at an empty oyster bar. The guy who ran the bar used to live in LA and had done some acting and producing in the past. Remember the huge bald Chinese dude in ‘Batman Begins’ who started a fight with Bruce Wayne in a Chinese prison? Yep, that’s him. Except he had hair and no disfiguring scars in real life. He was really nice and gave us another beer for free after we declined a second round because we said we couldn’t afford it. Then after that he split another free beer with us (“Blue Ice”) that is popular in Hong Kong and is locally brewed there, but owned by a beer company in the Phillipines. We all agreed it didn’t hold a candle to Guinness. After getting back to the city, we walked down to the nearest village for a nice local dinner, then headed back to Kadoorie, where we met and talked with a lot of the permies that had just arrived. A lot of people there had heard of Panya before, which was pretty cool. Some had even visited before. There’s a pretty strong contingent from Taiwan and the Phillipines, and a couple of people from Thailand, too. And there’s some pretty amazing projects going on in a lot of these places, too. After talking for a while and getting to know some of the people, we decided to call it a night. Stay tuned for more posts! I know I am a day behind, but I will try to catch up! And there will be photos in the next post, not to mention a lot more permie-related stuff. Help bring Panya to the SE Asian Permaculture Convergence in Hong Kong! The Panya Project would like your support in helping send two of our members, Nick Tittle and Adam Dusen, to the 2012 Southeast Asian Bioregional Permaculture Convergence in Hong Kong in November! This convergence is the first of its kind and therefore a very exciting event and an amazing opportunity for Panya. We would like not only to attend, but to be featured as speakers at the event and lead some workshops, which we have been invited to do by the organizers. We also plan on setting up a booth at the pre-conference festival to show the region what we are doing at Panya and exchange ideas, swap seeds, recruit volunteers/managers, etc. If you would be willing to help us achieve this goal, please check out our fundraising page on WeTheTrees for more information! Thanks so much for your support! We are well into the rainy season here at Panya, at that usually means a pretty slow time here. Not slow in terms of nothing going on, because Panya never stops, but just not too many people around. For the past week we’ve just had seven people at Panya, including Kae and Ping. But the slow time here has been enjoyable. Passionfruit are in season now and we have as many passionfruit as we can possibly eat. Also, with less people, we can eat a lot more by foraging in our gardens and the food forest. Tonight for dinner we had a salad entirely from the garden, cassava chips from the food forest, fried banana fritters from the banana firebreak, and homemade mayo from Pun Pun’s eggs. As far as projects going on at Panya, we recently completed the construction of a bamboo fence around part of the food forest to protect our chickens, ducks, and geese from dog attacks. It’s working like a charm so far and we are starting to buy more chickens to build up our flock again. With any luck we should be eating our own eggs again soon and can remain self-sufficient for eggs well into the future. Most of our time now is occupied by just keeping the gardens going and keeping the grass down, as this time of year everything is just growing like crazy and the jungle threatens to swallow up Panya completely. But we are staying on top of things and finding enough time to relax along the way. Oh, and my own private project that I spend many afternoons working on is “Project Ant Pond” at the ‘chapel’, building a pond below the house to keep black ants from being able to invade the house. I was driven out of there a couple weeks ago by them and am now taking the fight to them. Let’s see how the ants handle a pond full of mosquito fish. Checkmate… I hope. The site was dreamed up and created by the Panya Project’s founder, Christian Shearer, so we are really excited and proud of Panya Projects connection to this site. A great way to check it out is by taking a look at the Permaculture documentary campaign that was shot in part at Panya, and is led by some of Panya’s favorite family members, Christian, Geoffroy Goddeau, Matt Prosser and Taiga Marthens. WeTheTrees, Crowdfunding for Permaculture. Now Launched! WeTheTrees.comhas just officially launched their permaculture crowd funding platform, bringing a new and exciting tool to the permaculture world, and an ability to easily and creatively raise funds. This platform helps organizations and individuals around the globe gather the resources needed to meet their goals. Effort, desire and passion do not tend to be limiting factors for the students and practitioners of permaculture. The ability to dream, design and use information and imagination does not hold back the permaculture community. The greatest limitation almost across the board is often that of economics. With access to the right resources, including those in the form of dollars and cents, the individuals, and the movement as a whole, could be achieving much more and be that much more effective at achieving their goals. Just to let everyone in the Panya Project world know, the new permaculture crowd funding platform WeTheTrees has just quietly launched, and the first campaign up on the site is for a solar cooker for Panya! As of this writing it is already over 75% successfully funded, so it seems very likely that it will succeed. WeTheTrees is looking for campaigns to be posted. If anyone has anything permaculture, environment or social change related that they want to fundraise for, big or small, now would be an excellent time to get your campaign up on the site, because as soon as the site has 8 campaigns posted, they are going to do a publicity blitz, and public launch. This should drive a fair amount a traffic to the site, and give your campaign an opportunity to raise some money. Lots of love, and keep up the good work. 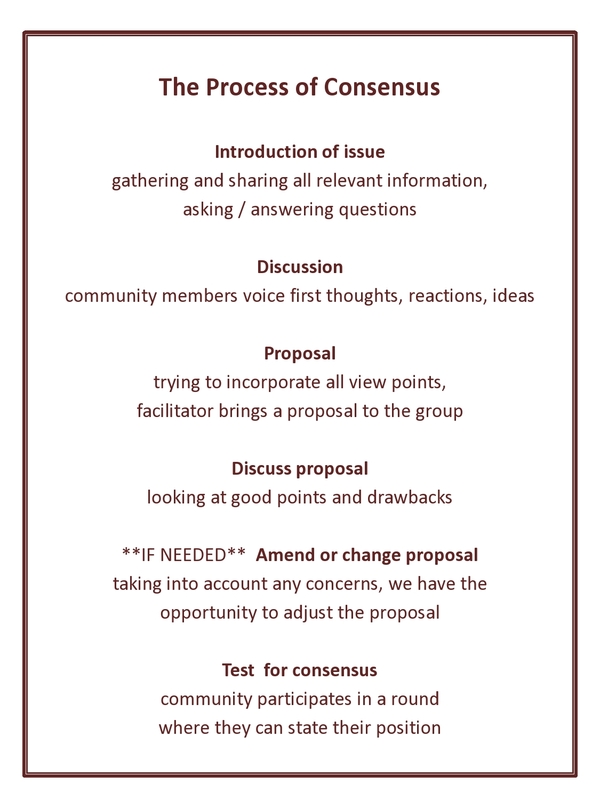 The new decision making process that we’re currently using at the Panya Project has shown to be effective and save us a lot of time that used to be spend in useless and tiring conversations. Below is a describtion that serves as a guideline during the process. 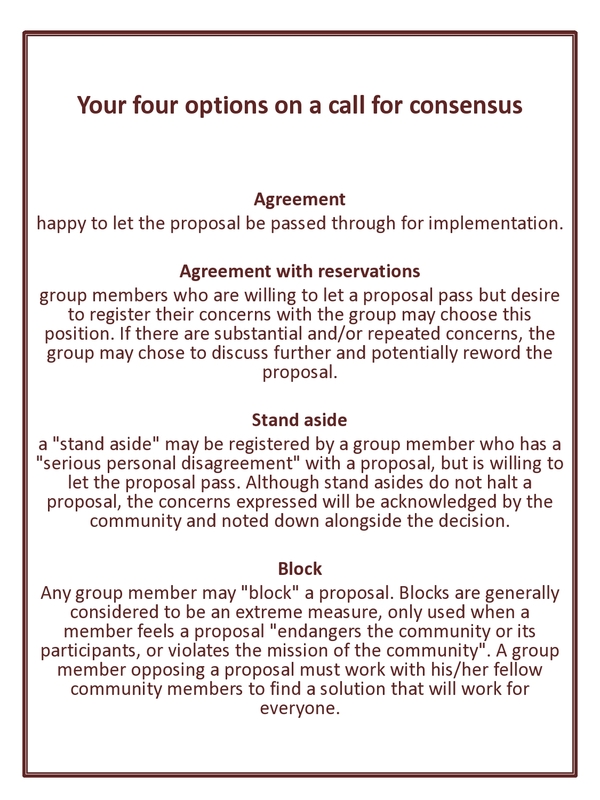 We are using hand signals for each of these options, so that so that a quick overview on the groups standpoint is possible. Panya CQ becomes Rak Tamachat Permaculture! Toni Robinson is one of the permaculture managers at Panya’s sister site in Si Khio, Thailand. She’s written this blog as an update to all the awesome developments over the course of the past few months and to inform you of our internship offering! Integrating and biomimicing to follow our trust and belief in permaculture and natural systems are our prime purpose at Rak Tamachat Permaculture Farm, Central Thailand. We see the permaculture ethics and principles as our pillars to move toward a sustainable farm and world. The role of our internship (the next one beginning in June 2012), and our activities here contribute to our functioning system. Here are the details.. see if you can pick out all 12 principals! In a rural village at the Southwest corner of the Isaan Plateau, just over an hour drive south of Thailand’s second largest city, Korat, a band of tenacious permaculturalists have just arrived at the site of their new home. Over the course of the next year, infrastructure will be erected, community and teaching spaces will be established and a traditional corn and rice farm will undergo a dramatic metamorphosis. The work here has already begun… and I’d like to take you along for the ride! We arrived on site on a warm mid-January afternoon full of excitement and anticipation. What wonders awaited us on this amazing new permaculture adventure?